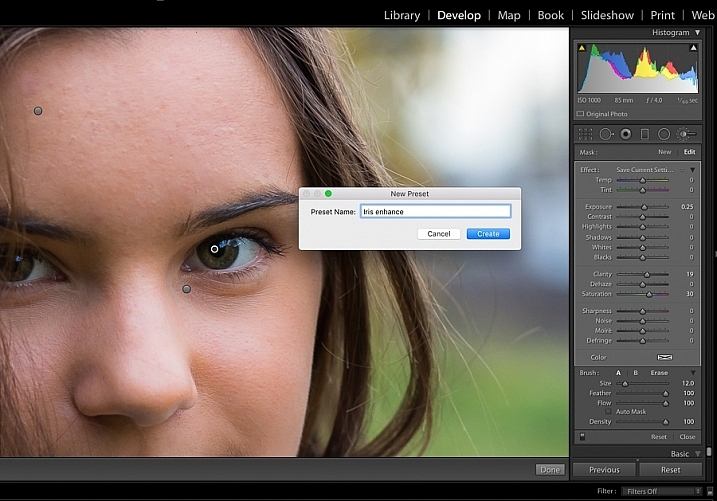 Lightroom’s Adjustment Brush tool allows you to make precise local adjustments to your photos. You can use the brush to simply lighten or darken an area of your image – the digital equivalent to burning and dodging in the darkroom – or adjust contrast, saturation, clarity and a host of other settings. You can also combine any number of settings on the same brush. Along with its custom settings, the brush tool offers a range of presets. These are loaded with all the adjustments needed for specific purposes such as teeth whitening, iris enhancement, and so on. Presets can save you an infinite amount of time if you edit the same genre of photos frequently. 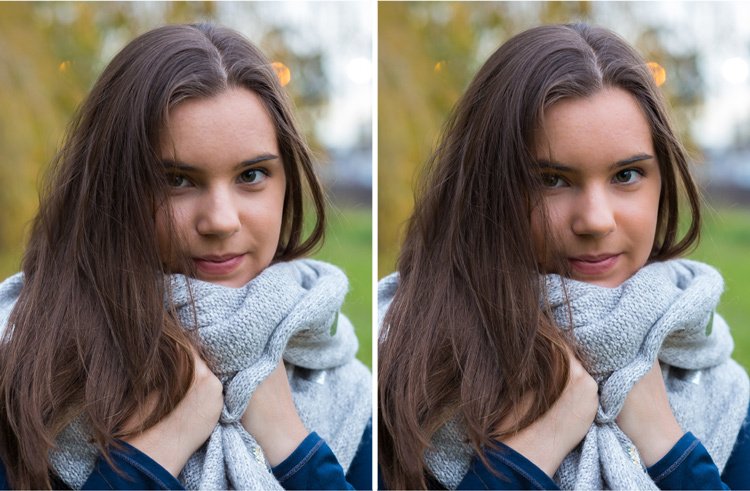 If you are a portrait photographer, having brushes pre-loaded with all the adjustments to soften skin, brighten eyes and lighten teeth saves you having to fiddle around with the sliders every time you edit a portrait. You simply click on the brush preset you want, and you’re good to go. The problem with factory installed presets is that they tend to be heavy-handed. 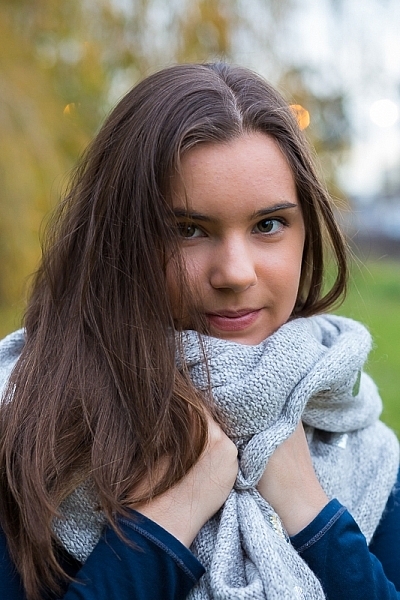 The skin softening preset, for example, takes the clarity slider all the way down to -100. This irons out every imperfection, resulting in luminous, plastic-looking skin. While it might be tempting to give your subjects a virtual facelift, you’ll end up with a portrait that no-one believes, because it bears little resemblance to the real person. Ditto with the iris enhancement – the preset responsible for those bright, over-saturated alien eyes. The good news is that you can create your own custom presets either from scratch or based on the existing presets. You can also import Adjustment Brush presets, which you can use as they are, or tweak to suit you. The Skin Soften brush is one I use on most of my portraits. I have a different brush for each of: mature skin, youthful skin, and men’s skin. Why soften skin at all? This is the photograph with global adjustments only. Some people question the need to soften skin at all in post-production. Of course, it is an entirely personal decision, but here’s my take on it. I am often surprised at how much older people look when I upload their photos to Lightroom than how they looked in the flesh. While the naked eye sees a far greater range of shadow and light than the camera does, it sends messages to the brain to makes adjustments. So, the way we perceive an animated face in the flesh is quite different to what appears in a high-resolution image. Digital cameras are brutal. They pick up every tiny imperfection and hold it in a static image to be scrutinized. That said, one of my pet peeves is over-softened skin. We’ve all seen portraits of mature people with their skin softened to try and emulate a twenty-year-old. It looks ridiculous! A greater shame, I believe, is to over-soften young skin. There is already too much pressure on young people to fit unattainable stereotypes, we don’t need to make the problem worse by creating unrealistic images of them. 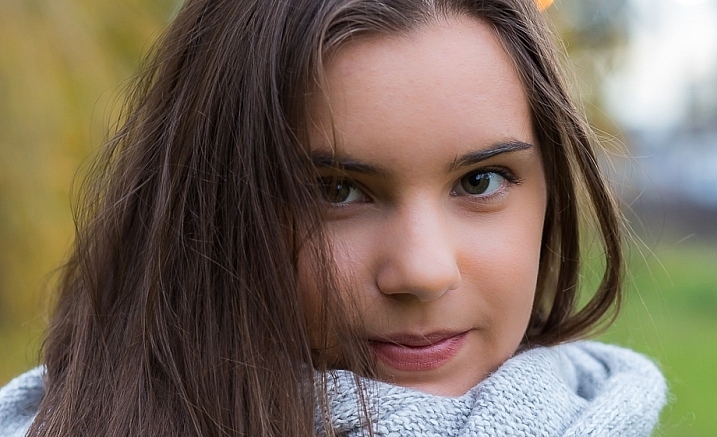 This is a photo of my daughter, shot in natural light at dusk. I have made global adjustments following my workflow for basic portrait editing in Lightroom, now to the local adjustments. 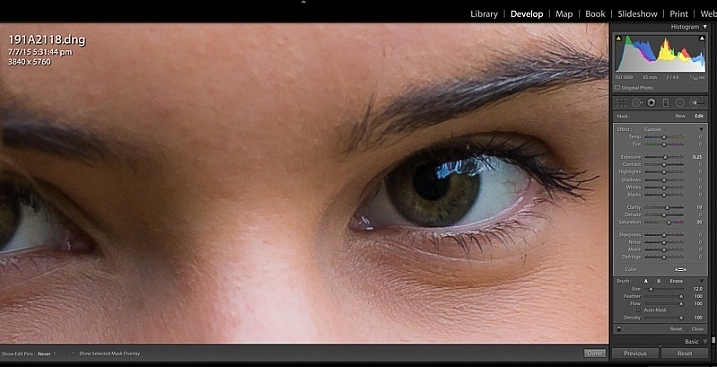 In the DEVELOP module, enlarge the image so you get a close-up look at the skin. Now click the Adjustment Brush tool in the right-hand panel (or click K on the keyboard). Zoom in to get a close-up view of the skin and select your brush tool. With the Adjustment Brush tool selected, take a look at the sliders in the adjustments panel. You’ll see two little arrows next to the word Custom. 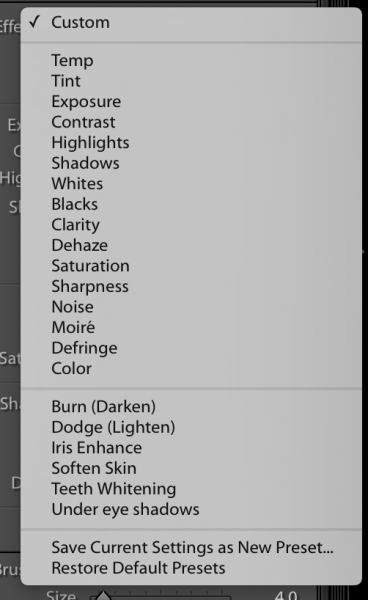 Click on the arrows to open the pull-down menu, showing all of Lightroom’s standard brush presets. Select on the Soften Skin preset, and brush it all over the face. Click on the arrows next to ‘custom’ and this panel will appear. As you can see, Lightroom’s default settings have turned my lovely teenage daughter into a Barbie doll, with the clarity slider sitting at -100, and the sharpness at +20. 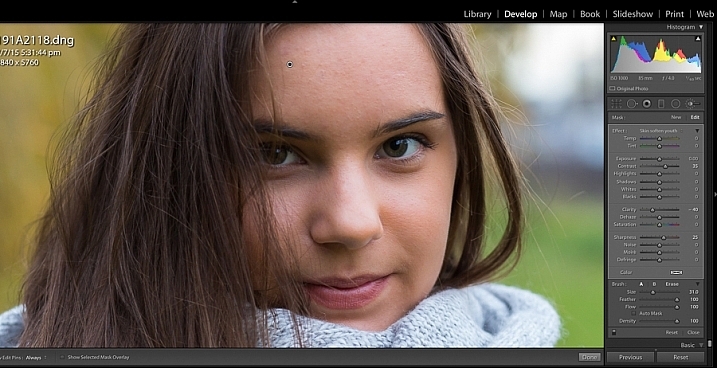 Lightroom’s Soften Skin brush preset has made her skin look unnatural. With the brush tool still selected, move the clarity slider until you achieve a look you are happy with. You will be able to see the effect live as you move the slider. With reduced clarity, you also get reduced contrast, so increase the contrast slider a bit too. You can also increase shadows and decrease highlights, although with this particular image I don’t feel I needed to. Move the adjustment sliders until you are happy with the effect. When you have achieved an effect you’re happy with, click on the arrows next to Custom again to open the brush presets menu. Select Save Current Settings as New Preset. Another box will open, prompting you to name your new preset. 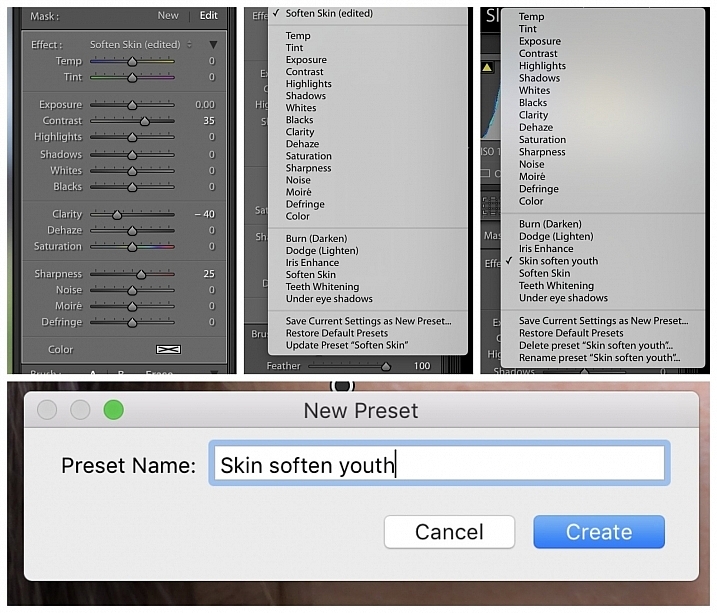 Choose a name you’ll be able to identify quickly (in this case I called it “Skin soften youth”), and click Create. Next time you open the custom brush presets menu, your own preset will appear in the list. When you’re happy with your adjustments, save them as a new preset. The process for creating a brush preset from scratch is almost identical to the steps outlined above. The only difference is, rather than using Lightroom’s brush preset as a starting point, you create your own from scratch. Select the Adjustment Brush tool. Adjust the sliders to achieve the desired effect. In this example, I have created an “iris enhance” brush preset. The exposure, saturation, and clarity were all increased. As you move the adjustment sliders, you’ll see the effect each one has on your image. As with the previous process, click on the arrows next to the word Custom, then Save Current Settings as a New Preset. Name your preset, and you’ll see it listed among the brush presets next time you want to edit a portrait. Select ‘save current settings as a new preset’ and name your preset. The final image, with local and global adjustments. You can buy brush presets online, and many sites offer free downloads in exchange for your email address. If you decide to download free brush presets, be sure it is from a reputable site. Once you’ve downloaded the presets, you’ll need to import them into Lightroom. 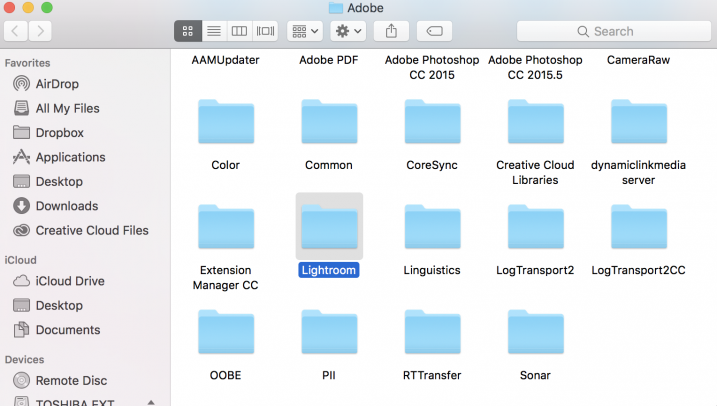 To import your presets, you first need to locate the folder where Lightroom stores your brush presets. 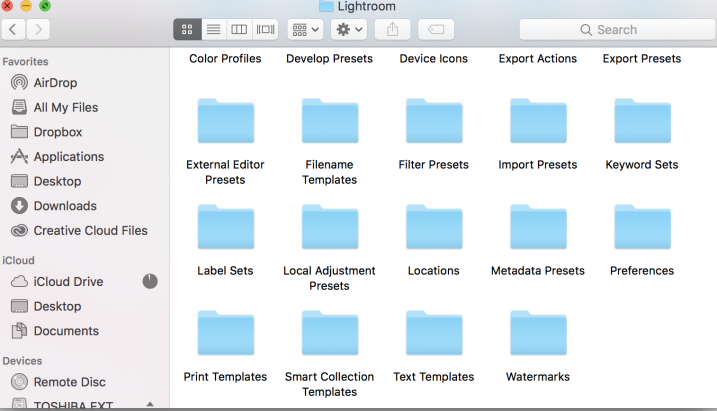 From your top menu, go to: Lightroom > Preferences > Presets, and then click Show Lightroom Preferences Folder. Double-click on the Lightroom folder, and inside you’ll see the one named “Local Adjustment Presets”. This is where your brush presets are stored. Once you have located the Local Adjustment Presets folder, simply drag and drop your newly downloaded preset files into this folder. You should only drag and drop individual preset files here, not folders or zipped files. 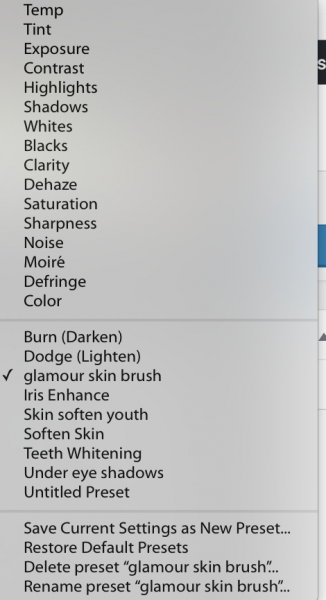 When you re-open Lightroom, you’ll see your new brush presets in the drop-down list of brush presets. Our editor, Darlene, sent me some brush presets to try, and I have imported her “glamor skin brush” preset. You can see it has appeared in my presets list now. If you find the imported presets are not quite to your liking, you can go back to step #1, adjust them to suit your tastes, and make them your own. Brush presets are such wonderful time-savers. As your editing style evolves, you can adjust and delete your brush presets as you go, or add new ones. I hope you’ve found the information in this article useful. Please share any tips and ideas you’ve discovered about Lightroom brush presets with the rest of the dPS community in the comments section below. The post How to Create and Import Custom Adjustment Brush Presets for Lightroom by Karen Quist appeared first on Digital Photography School.